Kalani Packaging is a national distributor of industrial and retail packaging. We are committed to earning your business with a warm aloha spirit. Contact Us to learn more or find out about special offerings. We are committed to earning your business with a warm aloha spirit. At Kalani we don't have customers we have partners. We'll provide cost effective solutions while exceeding your expectations. 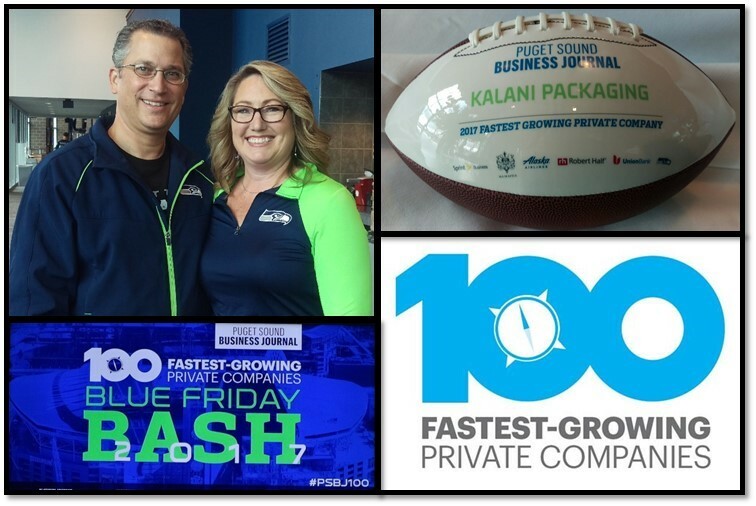 Puget Sound Business Journal has ranked Kalani Packaging as one of Washington’s fastest-growing private companies. The 100 companies included on the Puget Sound Business Journal 2017 list collectively generated revenue of $4.88 billion in 2016, an increase of $2.34 billion over their total revenue from 2014. The Kalani Ohana would like to express our mahalo to our customers and Puget Sound Business Journal for this wonderful honor. "Kalani Packaging helped Funko improve pallet security through the use of printed stretch film." "Excellent service as always! I can honestly say that I look forward to each order I place with Kalani knowing that it will be in such good hands." "James (our sales rep) is one of the most responsive and helpful people I know in the industry....In all of my years working with Kalani I have never had a bad experience. And they have great cookies!" "Kalani Packaging is our trusted supplier; we appreciate their attention to detail and the spirit of cooperation we receive from their entire staff."